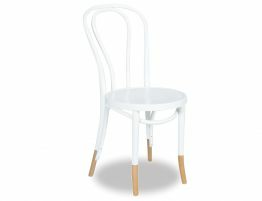 Our Thonet designed dining chairs are shown here in white with natural beechwood’socks’. These bentwood chairs are carefully painted by expert Australian craftsman. Each Vienna café chair is sanded, prepared, undercoated and top-coated in a 2 Pack Polyurethane finish. This lasting finish stops any bumps and skids, typical in family homes and busy cafes alike, from marking the chairs. 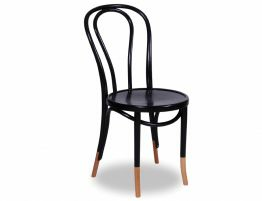 Many cheap, knockoff bentwood chair manufacturers use only a top spray paint option that will not handle the daily life of your busy kitchen or commercial business. At Relax House, our original Michael Thonet designed chairs come directly from the Polish factory that has been creating them for well beyond 120 years. 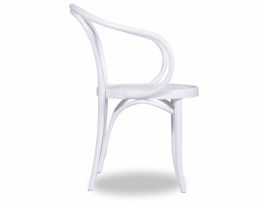 Put the chic white and natural café chairs in your café, your coffee house, your European bakery and more. 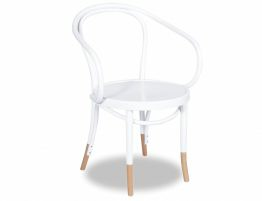 This stunning bentwood Café chair is expertly crafted from Beech wood and is pictured here in white with the feet left in the natural beechwood. These natural toned ‘socks’ give this classic chair a fresh modern update perfect for your space. Our white bentwood dining chairs are the bright ideal update for your kitchen, café, restaurant or dining area. Put our refined yet simple beech wood dining chairs in your home kitchen or dining area for designer touch that won’t break the bank. Bentwood dining chairs have been as popular as they have been in part because they look good but also because they are built to last. 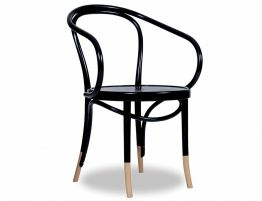 Our Thonet original designed café chairs have been made in the same way and in the same Polish factory that has created masterpieces in furniture for Thonet for so long. Pay attention to the trademarks of European legacy quality like the beautiful sunburst pattern that is subtly embossed on the seat of our Michael Thonet designed original. 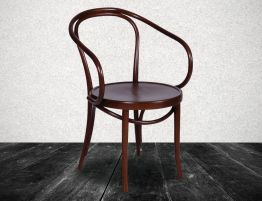 If you are in the market for new furniture, consider the bentwood designer pieces show here. 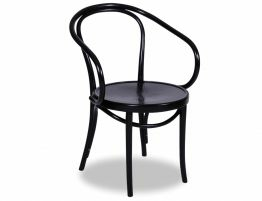 We offer a huge selection of Thonet designed originals and other quality European made bentwood chairs, bentwood barstools and more, direct to you.